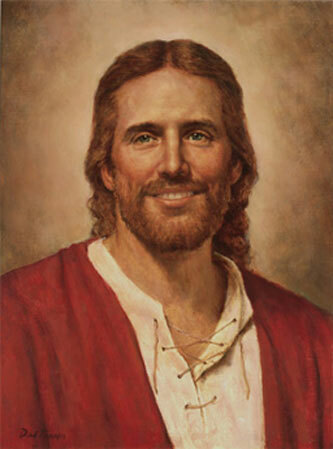 For a long time, the idea of painting Christ with a smile has been in the back of my mind. I’ve wanted to show a very friendly, personal, and loving portrait—one that children especially can relate to. One Sunday, our ward was having the Primary Sacrament meeting program. The children were singing and reciting their parts and out of the corner of my eye, I noticed a man with this wonderful smile on his face. That smile just drew me in. After the meeting, I looked back and said something like, “I noticed your smile.” I told him that was the kind of smile I was looking for to use in a painting. I don’t even think he realized he had been smiling, but he told me the story behind his expression. His little boy had been afraid to go up on the stand and participate in the program. He was scared to sing and do his part in front of that big congregation because he was new in the ward. The father knew his son was afraid and didn’t want to go up there, but he did it anyway—and he did a great job. That man’s smile was a very genuine, loving smile. It was a father proudly watching his son accomplish something that was very difficult. The father agreed to pose for a working photo. I just told him, “remember your son in the program and remember how you felt as you were watching him.” I really wanted to do this painting, and I wanted it to look just right. But even when I was working on it, I kept debating it in my mind. I don’t know why, but I didn’t know how people would accept this kind of painting of Christ. We’re all accustomed to a more somber expression when we see paintings depicting the Savior. The response to this painting has been very interesting. At first, some people are really taken back by it and they don’t know whether they like it or not. My own daughter didn’t like it when she first saw it. But the same thing happened with her as with most people who see Christ’s Love—now it’s her favorite of all my paintings. The other thing I’ve noticed is that children are immediately drawn to this painting. I guess they don’t have a lifetime of seeing a certain, more stoic kind of image already in their mind and they are very comfortable seeing Jesus with a smile. I think they’re quick to pick up on the feeling I intended to portray with this painting—a feeling of overwhelming and unconditional love.